Insight, exploration, elaboration — tools for better jewelry design and smarter business and marketing strategies for handmade products. Whether you are just beginning as a beader/jewelry maker, or have been making jewelry and beading for awhile, we strongly suggest that you take advantage of our Orientation to Beads and Jewelry Findings. Click the link at the top of this blog page. Hello, if you don’t already know by now, as millions surely already do, my name is Marjorie. People know me as a bead jewelry designer with an obsessive penchant for gemstones, pearls, more gemstones, more pearls, even more gemstones and even more pearls, and, of course, all the other stuff, like chain, wire, sterling silver, and you know what else, I don’t have to tell you. And if you have heard that I spend more time on the internet than God, well, you might be right. Excerpts From This Ever-Evolving Tale….. I don’t mean to drag a poor Elephant by its tail, kicking and screaming, into our bead world against its wishes. Nor do I perceive the elephant to be a threat, like you might see an Elephant in the boudoir, or the fine china store. And I don’t want you to shut your eyes and pretend not to notice that this Elephant is here, standing shoulder to shoulder with every beader and jewelry maker around. Intuitive. Inspired by Nature and the world around me. Translating feelings and senses and vague images into beautiful jewelry, wonderful beadwork, exciting wearable pieces of art. Beyond following step by step. We’re on the edge and we’re high strung about it. I’m a store dog, from a long line of store dogs. My name is Lily. I’m part Chihuahua and part Shiatsu. Other store dogs have it so much easier than I do, because I work in a Bead Shop. I’ve got obstacles and responsibilities. Wherever I try to lay down, there are beads. In the classroom, people are talking, talking, talking and always waving those needles all around. In the front, everyone wants to pet me and make nice — not my thing. And, try as I may, and feign as I might, I don’t think I’ll ever master this beading and jewelry making stuff. After all, I can’t put beads on a bone. Land of Odds – Your source of over 35,000 beading and jewelry making supplies, books, tools. Home of The Ugly Necklace Contest – A Jewelry Competition with a Twist, and All Dolled Up: Beaded Art Doll Competition. The Center for Beadwork & Jewelry Arts – A design-based education for beading and jewelry making, skills-based, professional, developmental, and broad-based. Teaching about making choices relative to quality concerns, artistic appeal, durability, functionality, wearability, move-ability. Warren Feld Jewelry – a jewelry designer with many years of experience, and a strong advocate for a design-based, rather than project-based, educational programs. 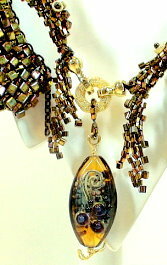 The Open Window Gallery – a showcase for Nashville, Tennessee area beadwork and jewelry artists. Be Dazzled Beads – one of the larger and finer bead stores you’ll ever visit, located in Nashville, Tennessee. Have fun! Learn! Enjoy! Participate! Share your own experiences and thoughts as a beader or jewelry maker, newby or not. and Announcements about Special Sales at Land of Odds (www.landofodds.com). Click HERE. I have really enjoyed your site! Like really enjoyed it! I’m a fashion designer trained in Belgium currently living in Greece. Although I worked for at least a decade as an editor in accessories for glossies in Athens, the last years I’ve started making my own stuff, rarely using metal as I’m in no position to work without the help of a goldsmith, so it is mostly couture, stitch-work and needle work…I’d love to get in contact with you anyway, best regards, Dimitrios.